Jeff Markoff is among nine Seattle firefighters who were injured in the March 9, 2016, blast caused by a natural-gas leak. Damage was estimated at $3 million. 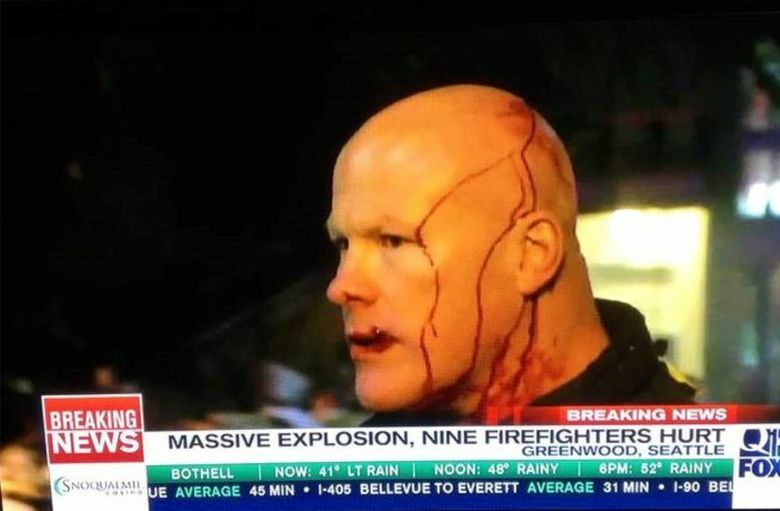 A Seattle firefighter who says he was knocked out by the force of the Greenwood natural-gas explosion last year is suing Puget Sound Energy (PSE) and its contractor over the blast. In the lawsuit filed Friday, Jeff Markoff said he was about 90 feet from the epicenter of the alleyway explosion that leveled two buildings and damaged dozens more. He said he has since experienced “ongoing cognitive difficulties, severe headaches, hearing loss, disturbances such as recurring images after the explosion, memory loss” and other health issues. Two-by-fours and concrete rained over his head, he said. “There’s increasing concern that the blast has caused some brain injury,” said Markoff’s lawyer, Darrell Cochran. Markoff, who has been with the Seattle Fire Department for about 18 years, said he has only missed three or four shifts after the explosion. “We’re used to picking ourselves up and dusting ourselves off after something like this,” he said. But since the explosion, he says he’s experienced health issues he thinks are related to the blast. In his left ear, which was facing the blast, he often hears a high-pitched ringing, he said. Sometimes, he gets distracted during household tasks. Loud noises startle him. 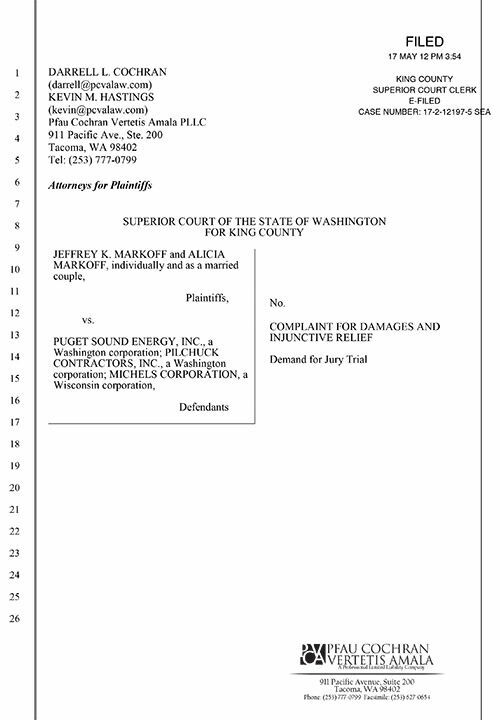 “The most important part of the lawsuit is to make sure Puget Sound Energy has no choice but to do a comprehensive analysis of its pipelines, and particularly its abandoned pipelines to make sure they’ve been capped and cut off and are no danger to the public,” Cochran said. Markoff was among nine firefighters who were injured in the March 9, 2016, blast. The firefighters had responded to a report of a natural-gas leak near Greenwood Avenue North and North 85th Street around 1:04 a.m. As the firefighters were trying to pinpoint the source of the leak, a huge explosion ripped through a building at about 1:40 a.m.
All were treated at a Seattle hospital and released the same day. A state Utilities and Transportation Commission investigation found that employees of a contractor hired by PSE for pipeline maintenance did not properly cut and cap the gas line, which allowed gas to flow to a retired line. In March, PSE reached a $1.5 million settlement with the Utilities and Transportation Commission (UTC) over the March 2016 explosion. The settlement calls for PSE to complete “a comprehensive inspection and remediation program” of thousands of retired gas lines. It the utility does not comply, it will have to pay another $1.25 million. UTC commissioners have not yet approved the settlement terms, but discussed it at a Monday meeting. The commission will likely make a decision this summer, according to a UTC spokeswoman. PSE spokeswoman Janet Kim said the utility would not comment on Markoff’s lawsuit because it is pending litigation. “We’re committed to the safety of our community, and we don’t want to have a Greenwood-type event again,” Kim said. She added PSE had already begun working on an inspection program for its retired gas infrastructure and had worked with the Seattle Fire Department on improving training for first responders to gas leaks. Markoff said he has had near-death experiences as a firefighter before. He said he understood and was willing to accept the risks of his profession, but was troubled to read investigators’ case summary after the explosion. Evan Bush: 206-464-2253 or ebush@seattletimes.com On Twitter @evanbush. Information from Seattle Times archives is included in this story.